Hybrid Trekking bike - STEVENS JAZZ. Specifications: Aluminium frame, Shimano 8 speed gear shifter system with a triple chainset, giving a total of 24 gears, and front suspension. This bike is ideal for trips around Mallorca from hotel to hotel, to get around town, to go shopping, to go to the beach or to explore some of the quieter country roads. We offer two different frams. For sizes S/M/L Hybridframe, Stevens Jazz Lady and for sizes XL/XXL a Maleframe, Stevens Jazz Gent. Bike Type A comes always without light. 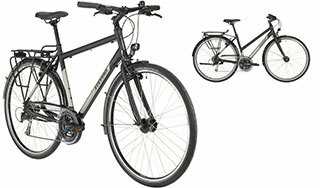 Our rental bikes can be purchased at attractive prices all year round. Please call us or e-mail us.